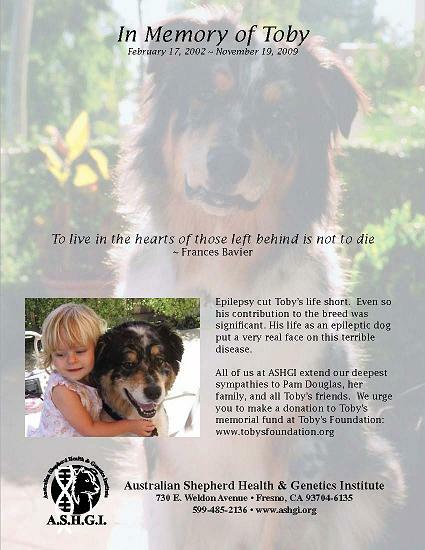 These memorial ads by Toby's Foundation and ASHGI appear in the current Australian Shepherd Journal and Aussie Times magazines and on our website. Thank you to ASHGI for a beautiful and thoughtful ad! A global initiative to raise epilepsy awareness worldwide. 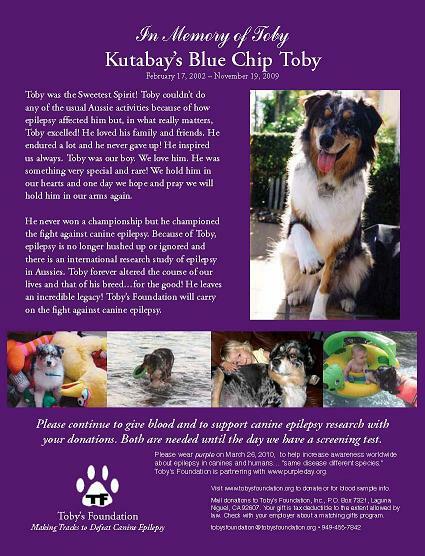 Toby’s Foundation is partnering with www.purpleday.org. Please visit their website for more information. Please wear PURPLE on PURPLE DAY, March 26, 2010. Purple Day is a simple yet effective way to unite with others around the globe to increase awareness of epilepsy for both canines and humans. SAME DISEASE - DIFFERENT SPECIES!